Barnes & Noble's touchscreen Nook Color—a reading-centric, 7-inch Android tablet with full color books, magazines, newspapers and apps is well, surprisingly good. It might be the best Android tablet yet, even. Update: Video! The new Nook sports a seven inch 1024x600 full-color LCD touchscreen made by LG, accelerometer-enabled for both portrait and landscape orientations. The screen sports a laminated coating that should minimize glare. The pixel density is nice—if you're comfortable reading books on the iPad, this is better, though in the crappy lighting here it's hard to judge how awesome the glare-free coating is (or isn't). The device weighs in at slightly under a pound (15.8 ounces), and it's a little under half an inch thick. It's not impressively thin, but the roundedoffness is part of the reason it seems that way. For storage, you'll have 8 GB of internal memory to fill, and a microSD slot for future expansion. Wireless access will be confined to Wi-Fi for the time being, with no 3G version available. Barnes & Noble is claiming an 8 hour battery life, and that's with wireless off. The Nook Color is essentially a reading-centric Android tablet with a heavily customized interface. In demo form, it's got some ever-so-slight stuttering all through the experience, from swiping through full color books to pinch-zooming. The lower portion of the Nook Color's interface contains swipeable book (or magazine) covers, easily thrown up into the main portion of the screen for reading or sharing online with friends. The library view categorizes your content into customized shelves (sort your newspapers by themselves, for example), along with personal doc and PDF files. 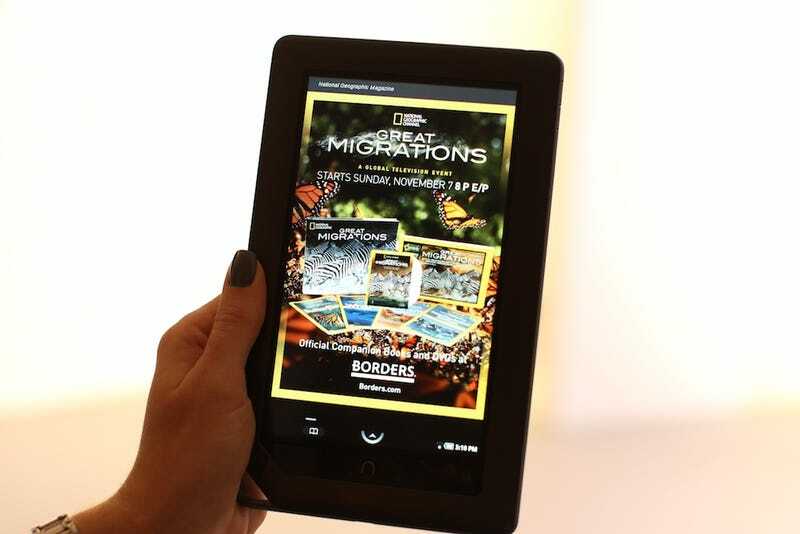 • Support for the existing 2 million "nookbooks" in the Barnes & Noble Nook library. • First device to offer over 100 color newspapers and magazines (both individual issues and subscriptions), including big names like The Wall Street Journal, The New York Times, Rolling Stone, and Elle. The Times looked way more basic than it does on the iPad when we saw it running. • "Nook Kids" will read selected interactive picture books to your children with the help of professional narrators. • The Nook Color will play "most" video formats outside of Flash. • Barnes & Noble was cagey about how much of the new content would be coming to its iPad app. We're guessing yes to color ebooks and maybe some elements of the kids' books, but not the newspaper or mag subscriptions. The Nook Color is going to be the best place for B&N content—which is interesting, given that the iPad is in many ways, still the best Kindle device. So, the Nook Color is built on Android. And it'll run apps. But not Android Market apps. There's no access to the Android Market. No, developers have to develop them exclusively for the Nook Color, and it's only going to be a handful of close partners launch, like Pandora. We're not sure what's going to be mean for apps on this platform—how eager are devs going to be to jump on this?—especially considering apps won't be backward-compatible with existing Nooks. But apps that are built for Android will be an "easy port" to be submitted to B&N's own store after being optimized for the 7-inch screen. "Continuous" reading will be supported, allowing you to stop reading on the Nook tablet and pick up where you left off on a Nook app. You can listen to Pandora while you read, on the plus side. "Nook Friends" will allow readers to share their thoughts on whatever it is they're reading through various social networking platforms, including Facebook and Twitter. You'll be able to post your favorite excerpt from a novel you're reading, for example, or set your online status to a particularly pithy quote, directly from the Nook. The Nook Color's gonna be $250 when it launches "on or around" Nov. 19, and they're "not thinking of lowering this price point anytime soon" no matter what, say, Amazon or Apple do. But you can grab the old Nook for $150. In a big move, it'll be available at Walmart, Best Buy, Books-a-Million (where it's become the official BAM reader), and of course, Barnes & Noble locations. Kindle, eat your heart out.